2 How to remove blueberry traces from things? 4 How to wash blueberries with white clothes? 5 How to remove blueberry spots? Summer is a time of rest and adventure, but at the same time you need to have time to make preparations for the winter. In the gardens, blueberries, currants, and cherry fruits are actively spiced. Experienced housewives use their spare time to cook jam, compotes, fruit drinks from them, prepare berries for freezing in the refrigerator. Often in such work seeks to help children. They grab berries with handles and liquid blueberry or cherry juice sprinkles onto clothes, leaving bright persistent stains on it. If the trouble occurred before your eyes, and the stain did not have time to dry out, get upset and puzzle over how to wash blueberries is not worth it. This will help the usual cool boiling water. Immediately put the kettle on the fire, remove the soiled clothing from the child and rinse it in cool water. The blueberry spot will brighten slightly. Unscrew the item, shake it, and lay it up in the sink. Take a kettle with boiling water and gently pour contamination with hot water. You will notice how the fresh blueberry stain starts to fade, and realize that it is not difficult to remove. Continue pouring water until the blueberry juice is completely out. Then wash the thing with a powder and forget about the trouble. Our experts advise using the method on a white cloth. And if you are sure that the clothes are dyed solidly. In some cases, poor-quality paint may not withstand contact with boiling water and lose its brightness. The method is suitable for removing stains from any berries, as long as the contamination is fresh. How to remove blueberry traces from things? Cut the lemon in half and squeeze out the 1 Art. l juice. Mix it in ceramic with the same amount of vinegar. Soak a sponge in the solution and carefully rub it with a blueberry stain. When the fabric is colored tightly enough, you can pour contamination with an acidic liquid and leave it on for 10 minutes. During this time, the stains from blueberries will be washed, and you will have to wash and rinse the product properly. When a delicate cloth is soiled, and you are afraid of damaging it with boiling water or vinegar, use sour milk or kefir bought in a store. Put a thing spoiled with cherries or blueberries in a small bowl and fill it with sour milk so that the spots are well soaked in liquid. After a few hours, check for contamination and make sure that there are no bilberry and cherry stains, they are washed off. Rinse clothes from kefir in warm water and wash with regular powder. 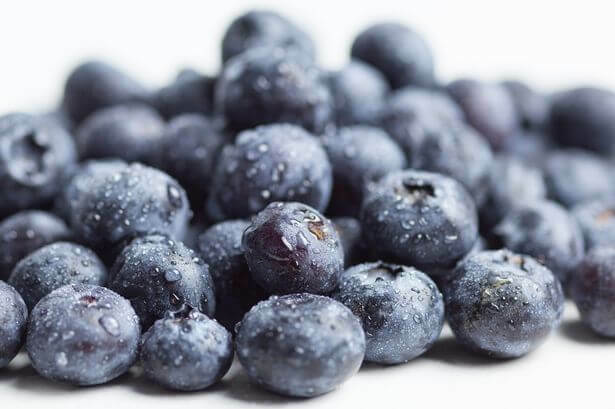 A proven way to wash blueberries from clothes is made from borax. Mix the borax with water in the proportion of 1: 1, soak the stain in the solution and rub it thoroughly. Fresh juice usually leaves easily. If the clothes are soiled in nature and it is not immediately possible to lock them, sprinkle the stains with table salt. This will increase the chance that the dried juice is washed out without any problems. A good remedy than wiping away the stain from blueberries and berry jam is ammonia. Type in a basin of cold water, dip in her dirty clothes, rinse and unscrew. Pour into a small plate 1 tsp. ammonia and mix in it so much salt to make a medium-thick paste. Liberally apply it on a wet blueberry stain and brush it. Then dip the item in cold water, rub the dirt thoroughly with your hands and rinse the stain under running water. Alcohol is an excellent solvent for natural dyes, so you don’t need to search for a long time how to remove blueberry stains. Open the high-degree liquid, moisten a cotton pad in it and carefully treat the stain. If the contamination is not completely removed, pour some alcohol directly on the stain and leave on 10 minutes. After rub the item with laundry soap and wash. Need a way to remove the stain of blueberries, which strongly implanted in the fabric? Try acetylsalicylic acid. Purchase a drug at a pharmacy, take 4 tablets, grind them into powder and dilute with 100 ml of warm water. Before cleaning, hold the 5 stain for 10 minutes under cold water tap. Unscrew the product, place it in an empty basin and cover with a blueberry stain. Leave on the 10-15 minutes and then rub well with a brush or with your hands. Pollution must be washed off. If there are small gray specks, you can get rid of them with quality powder or bleach. How to wash blueberries with white clothes? There are many ways to wash blueberries from white linen, if it is high-quality and natural. A simple method to remove stains - the usual "whiteness". Soak a white cloth in warm water and pour a little "whiteness" on the stain. The blue color will instantly begin to lighten and gradually disappear. You will need to wash the product with a powder in a washing machine. Our experts warn that "Whiteness" and other alkaline liquids are capable of eating away the skin of your hands, therefore, using them, be sure to wear rubber gloves. White blouses can spoil the chlorine, so they need a gentle effect. A proven way to wash blueberries from white clothes is Vanish bleach or ACE bio + oxygen. Before removing stains, wet the clothes in water, unscrew them and pour contamination with liquid “Vanisham” for white fabrics. Leave bleach on stains for 15 minutes. Check the fabric. If there are blue dots on it, pour hot water in a basin, place the thing there and fill the Vanisha cap with 2. After 2 hours, remove the clothes and stretch them in an Ariel or Tide washing machine for white things. This method helps to remove stains from blueberries and other berries, no matter how hard they ate into the fabric. Bleach "ACE bio + oxygen" fall asleep on a wet spot. After 20 minutes, it is necessary to rub hands well with hands, put the item in the washing machine, pour bleach, powder in equal amounts there and run the wash on 60 °. If you are looking for a safe method, how to wash a blueberry stain with delicate white clothes, it is better not to find fresh milk. Put a blouse or a t-shirt into a basin and drip a little warm milk on the stain. We must do it slowly, and gradually the blue blots will become brighter and disappear. Then you need to rinse the product in cold water and wash it in the same “Vanish”. It will acquire crystal freshness and whiteness. How to remove blueberry spots? When you need a remedy, than remove the blueberry spots with bright, colored clothes made of thin fabrics, try to prepare a special solution. To do this, measure 1 tsp. glycerin, combine it in a ceramic bowl with 3 tsp. vodka and 1 tsp. ammonia. Moisten a cotton swab in a liquid and clean it with blueberry stains. Pour the remaining solution in the solution and leave to soak for 2 hours. Then wash with powder and rinse. Fresh cherry or blueberry stain can be removed with hydrogen peroxide. Cover the soiled cloth with a small amount of liquid and rub it lightly. White clothing restores the original color with lemon. Rub a slice of citrus stain or drip a little lemon juice on the cloth. Berry stains can be removed by baking soda. Dissolve the powder in a small amount of water and apply a thick mass to the contamination. Wool items can be cleaned with gasoline. They need to gently moisten the stain and sprinkle it on top of semolina. After a while, the dirt will dissolve. In the process of cooking blueberry jam is difficult not to stain kitchen towels. If you don’t know how to clean blueberry stains, don’t rush to get new wipes. Try a proven method to return them to their original form. Take an iron 5 l bucket, fill it with water and put it on the stove. Bring the liquid to a boil and add 2 Art. l sunflower oil, 2 Art. l dry bleach and 5 Art. l powder for hand washing. Turn off the heat and put towels in hot water. After 2 hours, remove, unscrew and wash in the washing machine. Oily stain on clothes - getting rid of in all ways! Thank you so much for the advice with boiling water! I thought that I would have to throw the pants away, but the stain in the boiling water dissolved in my eyes. Thank you for the article! 5 stars out of a possible five! In the summer, this topic can not be not relevant. Of course, I, as a person who graduated from biofak, did not try the method of bleaching with “Belize” (sorry for tautology) due to the knowledge of the theory, but somehow I would risk it :) Still, the classical cleaning school is the best! More such articles: concise, informative (without decalitres of "water") and most importantly useful. I registered on the site - I will wait for new articles and reviews.